Poseidon is the ideal accommodation complex for those wanting to enjoy Kos Island while staying in Kos Town. Ideally situated just a 5 minute walk from the center of Kos Town, and only a few minutes from the closest beach. Nearby is the Kos Marina. Hotel is a basic 2 star hotel on a very busy main road which the brochures fail to mention. Rooms are adequate with efficient air conditioning included. These are tidied every day and linen and towels changed regularly. Breakfasts are the usual continental assortment and exactly the same each day. The pool is small and the surrounding area is rather scruffy and not big enough for the amount of guests. The sunbeds and mattresses needed a good clean as did the filter areas of the pool which were often blocked causing the pool area to overflow. This hotel is approx 5 minutes walk to the front and 15 minutes to the main town. There are lots of restaurants within a few minutes walk from the hotel. 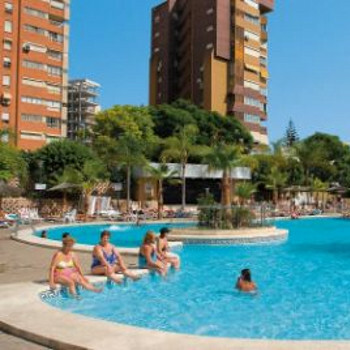 Although we traveled with Thomson they do not have a rep in the hotel so if you like to see a rep occasionally, book with Thomas Cook who has a rep visiting the hotel every day. However the staff at the hotel are very helpful if you do have any queries. Entertainment is a barbecue and karaoke night held each monday. This is the 3rd time have been to this hotel and are going again in May, June and Sep of this year. The staff are so friendly and laid back, but nothing was to much trouble for them. The rooms are basic but clean. The food was ok, typical continental breakfast, and we did eat lunch theere on occasions. The staff joined in with the entertainment. As we went B&B the food was ok, buns, cereals, toast, cheese and meats, jams, boiled eggs, cakes, tea coffee fruit juices which is fine but the menu didn't change and got boring, although melon was introduced before we left. The hotel was clean and the reason i didn't give 5 was our balcony table and railings were never cleaned and being opposite a hotel being built ( Thomas Cook failed to mention) this was essential. The location was ok 5 mins from the sea front but 15 min walk to Kos town centre. The staff in the hotel were very nice and friendly.The room was fine, free air con, safety deposit 18 euro's per week 22 for two weeks, fridge if you weren't self catering 20 euro's per stay. The shower was poor though as the mixer tap reduced your space in an already small cubicle. The shower door was a curtain and moved and stuck to you when you were trying to shower, very annoying.Entertainment was Friday and Saturday only although sky tv was in the bar area.As i have mentioned a hotel is being built by the side of the hotel and not a great view if you are unlucky enough to get a room facing this.Noise from this can easily be heard around the pool area.The hotel in general is very noisy, thin walls and everyone having to slam doors to shut them.With the hotel being on a corner traffic noise was a major problem also.Pool area was small i have to say so i used the Peridis Apartments pool area much nicer.Eating out is great lots of places to choose from, must give the Greek Taverna Hirodion a mention great food ,great prices, great owners. All in all i would book the Poseidon again at the right price, but i think there are nicer hotels/ apartments nearby.